ZENITH is the globally rock and mineral processing equipment supplier. 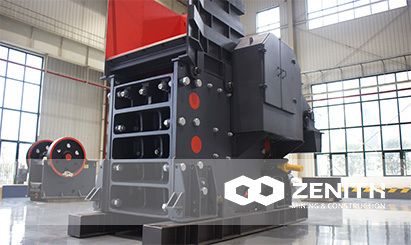 In order to solve such problems as low production efficiency, and difficult installation and maintenance of the existing jaw crushers on the market, ZENITH developed a new generation of energy-efficient jaw crusher - C6X series jaw crusher with its years’ experience in product development and production as well as services in thousands of production line projects. The C6X series jaw crusher has all international first-class level indexes (such as equipment structure, use functions, production efficiency, etc. ), and becomes the most ideal coarse crushing equipment on the market currently at home and abroad. Choose well-known brand accessories at home and abroad, such as bearings and motors, according to users’ requirements, so the quality can be more sufficiently guaranteed to meet users’ demand for different configurations. Elastic stop blocks and rubber shock absorbers are used to replace the rigid anchors, able to effectively absorb the vibration peak load, reduce the mutual impact between the crusher and the foundation, and thus improve the service life of the crusher.